This has been a very hard year. 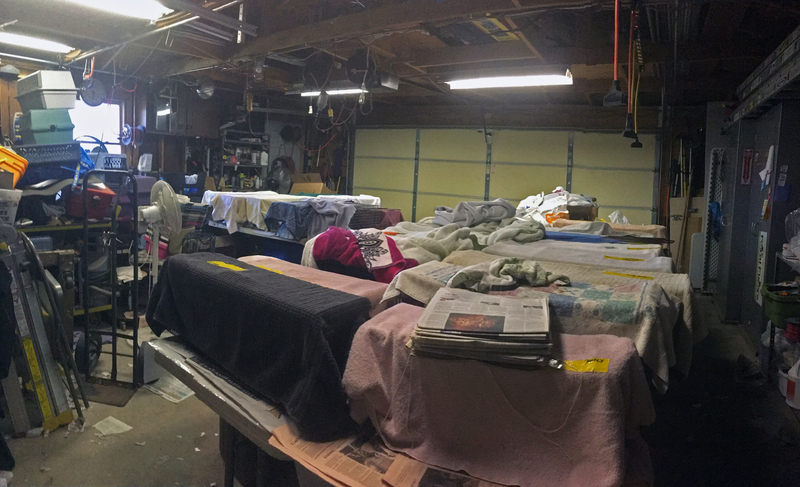 Many changes, fewer volunteers, fewer hours to do the same amount of work. Ferals result in more friendlies, without more fosters, the flow in must be halted. Therefore, our feral surgeries will stop on 11/1. The friendlies we have on hand at that time will get their surgeries as they get old enough but no new kittens will be accepted after 11/1. This is not easy to say “no”, but we are working with a limited resource – our time and our health. There has to be a reduction in workload somewhere so that the people involved in Feral Fixers can go on next year. If you trap, you are responsible for arranging spay/neuter, contacting rescues for placement of any kittens/friendlies. You can contact DuPage County Animal Services, ADOPT Pet Shelter, Catnap From The Heart, PAWS, SPAY IL or your own local vet. We will not be doing any scheduling until the weather breaks in the Spring – around April most likely. Every shelter is currently full of cats and kittens. Despite our efforts, kittens are still being born and there are not enough adoptions. 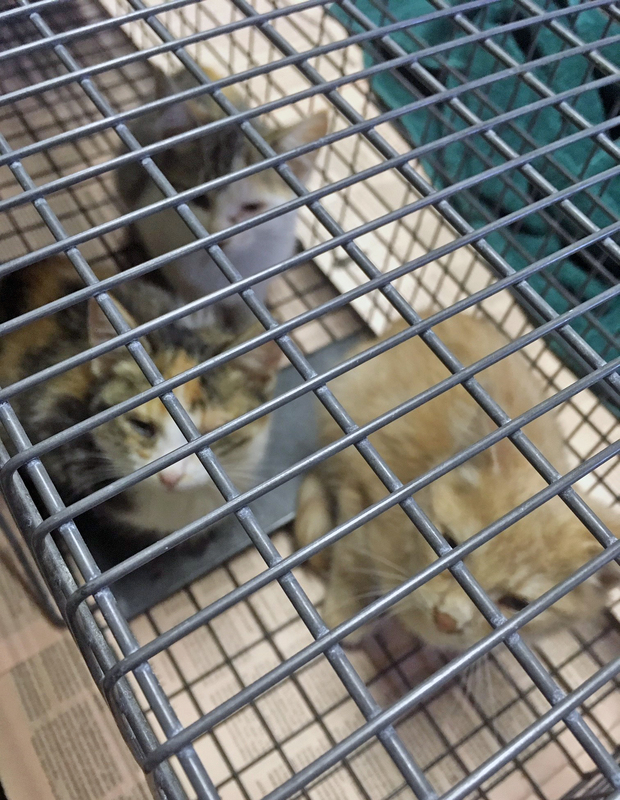 Rescues continue to bring cats in from out of area and out of state, further limiting our resources. Rescues continue to allow females to give birth, even when they are not sure how pregnant the female is – sometimes waiting almost the entire gestation period of 9 weeks. We currently have 44 adoptable cats and kittens on our Petfinder page. We have more kittens that just came in and will have to be fostered and neutered before posting for adoption. Please share our adoptables with friends and family so that we can get our “new” friendlies into foster and on their own way to new homes! 30 Cats and more to come! This post has some pics from today, 10/23. There are 30 traps and transfers in my garage, a few with multiple kittens inside because I ran out of traps on hand! Hopefully no one will poop on another’s head! 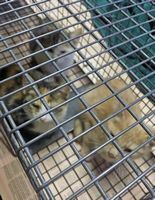 Tomorrow a very few kittens will be going on to foster but the rest will most likely stay in traps for another few days until they can find a foster. Or be in a cage in my basement – not a bad place but not ideal. Fall kittens are kind of late this year, usually the rush is at the beginning of September, not towards the end of October. Remember, we count on you, our “public” to speak for us, forward our adoption event information – this weekend, 10/27, tell people to fill out our adoption applications in advance, be pre-approved for that special cat that is coming their way! And bear with us during this year end, we want to be here, neutering our butts off next year! 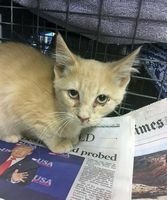 Since our last update, we have made 4 s/n trips and one single cat was neutered at Glen Ellyn Animal Hospital. In all, there were 36 ferals, 23 friendlies, with a few already neutered cats, there were a total of 54 surgeries for October so far, bringing the year’s total to 534 and the total since our beginning to 10,851. Many thanks to Charli, Debbie, and Dedra, for transporting cats this month! Couldn’t do it without you!